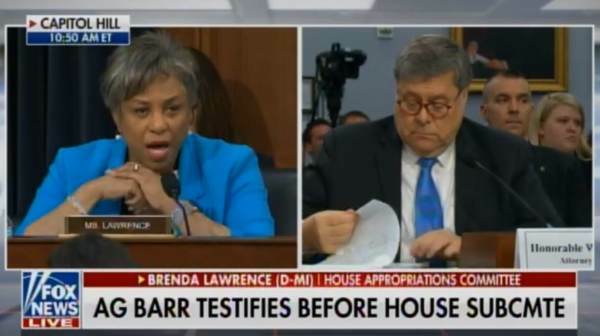 Attorney General Bill Barr absolutely DESTROYED radical Democrat Rep. Brenda Lawrence (D-MI) during the Appropriations Committee hearing on Tuesday morning. Rep. Lawrence tried to berate the Attorney General on the increase in hate crimes in the United States during the Trump administration. Barr quickly corrected the liberal Democrat with the fact that hate crimes have been increasing since 2013 — during the Obama years. Rep. Lawrence: Are you familiar with the data with the percentage? Have they (hate crimes) increased under the Trump administration? There are indications they have… Hate crimes, have they increased under this administration? AG Bill Barr: I haven’t seen any data that it’s growing since 2017. Rep. Lawrence: So is it a priority? You haven’t looked at the data. You’re not aware of it. AG Bill Barr: As I said in my confirmation hearing. I’m very concerned about hate crimes and intend to vigorously pursue them. The data that I have seen have shown an increase going back to 2013. So I agree with you, they have been increasing. But I have seen no data to say it’s different under the Trump administration. Attorney General Barr did not address the substantial increase in fake hate crimes during the Trump years.